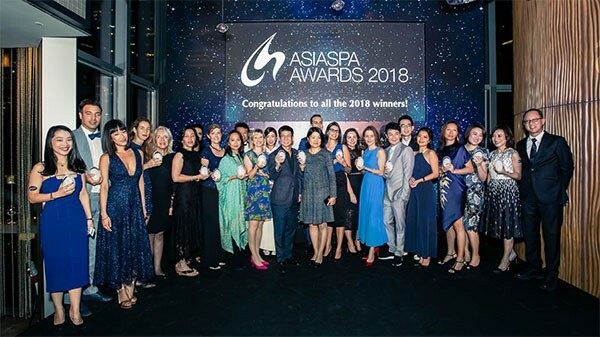 Hong Kong’s most anticipated spa and wellness event of the year, the 14th annual AsiaSpa Awards took place on November 15 at W Hong Kong with the glamorous occasion attended by representatives of the region’s outstanding brands. The 2018 Awards honoured nominees, industry icons and guests, for an evening themed ‘Tokyo Blue’. A panel of 20 judges selected the best in the business across 26 categories. Awards were presented to spas, hotels and resorts, retreats and products recognised for raising the bar of product and treatment standards. The elegant evening saw more than 400 professionals celebrate the winners who have demonstrated stellar products and services within the region’s best spas and resorts. These included Maia Spa, Fusion Maia, Da Nang City, Vietnam, which took home ‘Spa of the Year (Southeast Asia & the Pacific)’, while ‘Spa of the Year (North & West Asia)’ went to Chuan Spa, Cordis Hong Kong. Exception Marine, Thalgo was awarded ‘Anti-Ageing Product Line of the Year’, and MDNA Skin, MDNA Skin was recognised as ‘Natural Product Line of the Year’. Gaya Island Resort, Sabah, Malaysia, received ‘Destination Hotel/Resort of the Year’, while The Sukhothai Shanghai, China, was ‘Urban Hotel of the Year’. “This year’s AsiaSpa Awards are even more special because we’re celebrating the magazine’s 15th anniversary. We’re really proud of the staying power we have in the publishing world as an authority on all things spa and wellness in the region. It’s encouraging to see the commitment to improvement in the industry with so many professionals who are genuinely passionate about delivering authentic wellness through alternative therapies. They are the heart and soul of any spa and we celebrate their valuable contributions to this business. We are also delighted to announce Intraceuticals as our main sponsor for the 2019 awards,” says Stephanie Shiu, editor-in-chief of AsiaSpa magazine. We at AsiaSpa would like to express our gratitude to our event sponsor, Lapidem Tokyo and special thanks to W Hong Kong for sponsoring this year’s stunning venue. We are also thrilled to have the support of Sans Souci as our trophies sponsor this year. Sans Souci is a Czech producer of bespoke decorative lighting fixtures with over 12 years of experience and expertise in hospitality projects and interior design jobs around the world.